Praise be to God, May peace and blessings be upon the Prophet, His Kith and Kin. Today, we are celebrating the sixty-first anniversary of the glorious Revolution of the King and the People. This event not only commemorates an epic national struggle for freedom and independence, but it also reflects our commitment to make it an ongoing revolution aimed at fulfilling your legitimate aspirations and enhancing Morocco’s status as an influential player, both regionally and internationally. Since my accession to the throne, I have been keen for the spontaneous interaction between you and me to be the main pillar on which to build an advanced, cohesive society for all Moroccans, which makes everyone proud to belong to this community. The homeland is for all Moroccans and it is their duty, as individuals and groups, to join forces, with determination and steadfastness, to safeguard the unity of the nation and work for its development. Moroccans are ambitious people who have always aspired to rank high and catch up with developed countries. This ambition is not just a dream, nor is it unfounded. It is based on facts and on tangible achievements that have been made on the road to democracy and development. So, where does Morocco stand today? What is our national economy’s global ranking? Is Morocco competitive? Can it be classified among emerging nations? Needless to say, there is no single model of an emerging nation. Each country has its own development process, which based on its human, economic and natural resources, as well as on its cultural heritage. It is also contingent on the obstacles and difficulties each nation has to face. However, there are standards and requirements to meet in order to join this category of nations, particularly in terms of democratic and institutional development, social and economic progress, and regional and international openness. Of course, no country can move from one category to another overnight. It has to take advantage of all the positive changes that have been operated during its history. In this regard, Morocco stands out as a model. Over the last 15 years, our country has managed to consolidate its democratic process and lay the foundations for a comprehensive, sustainable development model based on a combination of structural projects and sustainable human development. Our national economy has witnessed profound structural changes, together with large-scale diversification in all areas of production. It has consistently achieved high growth rates and managed to maintain balance, despite the impact of the world economic crisis. In this regard, sectoral strategies have made it possible to achieve tangible results and have a clear vision as to how to reposition the national economy at the regional and international levels. The “Green Morocco Plan” and the “Halieutis Plan”, for instance, helped Morocco to obtain a Food and Agricultural Organization award for meeting the Millennium Goal on poverty and the fight against hunger two years ahead of the deadline. This was possible thanks to the balance both plans achieve between major high-yield projects on the one hand and subsistence, cooperative farming and traditional fishing on the other hand, because of the role they play in improving people’s income. The “Industrial Acceleration Plan”, which is based on an integrated approach that includes adequate vocational training, has contributed to consolidating the place of the national economy at the continental level. This plan has been boosted by a quantum leap made in the trade and finance sectors, as well as in digital economy. Infrastructure is also one of the main pillars of emerging economies and Morocco’s achievements in this specific field have contributed to sharpening the competitive edge of both businesses and national products. The attractiveness of the national economy has also benefited from continuous efforts to improve the business environment and create competitive economic hubs, such as the Melloussa-Tangier Industrial Zone. In this regard, I would like to say how satisfied I am with the contribution made by a number of private companies and public institutions to promote the national economy, at home and abroad. In this respect, the Office Chérifien des Phosphates (OCP) is a model, thanks to its effective national and international strategy, clear vision and sound, efficient management, which have consolidated Morocco’s position in the global phosphate market. The latter has become a universal focus because of its close link to food security. Another pillar of emerging economies is sustainable development and the opportunities offered by a green economy. In this context, the renewable energy industry has witnessed significant development thanks to major projects launched under my patronage, as well as to the energy efficiency strategy and the ambitious water resources mobilization scheme. The Moroccan solar and wind power scheme is a further illustration of our capacity to rise to the challenge, thanks to an early clear vision, as well as precise priority planning to meet our country’s needs and reduce foreign energy dependence by relying on our own renewable resources. Morocco needs to take a few more steps to confidently move forward and join emerging nations. The country has already become an international trade hub, thanks to its economic openness policy. This is corroborated by fruitful partnerships concluded with Arab countries, particularly Gulf Cooperation Council Member States and with sub-Saharan African countries (Morocco being the second investor in the African continent), the Advanced Status granted to the Kingdom by the European Union, the free trade agreements signed with a number of countries, in particular the one with the United States of America, the strategic partnership with Russia that we are seeking to deepen, and the partnership with China that we are working on. Morocco is also an essential link in multiparty and triangular cooperation, particularly when it comes to ensuring Africa’s security, stability and development. The gains achieved should not, however, be a motive for self-satisfaction, but a strong catalyst for further efforts and continued mobilization. As a matter of fact, if the Moroccan economy is to emerge, it should rely on its potential and the joint efforts of all actors; otherwise it is bound to miss a historic opportunity. Our development model has reached maturity and deserves to join the group of emerging nations once and for all. The coming years will nonetheless be crucial for safeguarding achievements, addressing malfunctions and boosting development and investment. So, can this model move forward, rise to challenges and tackle potential obstacles? In fact, nations rely primarily on the competitiveness of their corporate sector, mainly export companies. Unfortunately, Morocco is clearly lagging behind in this respect because of a weak, disorganized industrial sector and competition from the informal sector. In such a situation, strong corporations and businesses have to be set up to boost the immunity of the national economy, both to enhance international competitiveness and develop partnerships with small businesses in order to stimulate growth at home. The key to enhancing competitiveness and meeting development and job market needs is to have qualified human resources. The latter are also necessary to be in tune with the evolution and diversification of the national economy. As everyone knows, good governance is essential for the success of any reform. It is also a basic means for achieving the goals of any strategy. To what extent can a good governance system in the Moroccan production sector contribute to developing and upgrading the national economy? It is a fact that to catch up with emerging nations, we have to continue improving the business environment. This can be achieved especially by pressing ahead with administrative and judicial reforms, combating corruption and moralizing public life, which is not exclusively the State’s responsibility, but that of society as a whole, individuals and associations. The State’s strategic role as a regulator should also be enhanced and major reforms, namely of the retirement and tax systems, should be initiated. The State should also commit to upholding the principles of good governance in all sectors. The development process undertaken in many emerging countries has shown a series of negative symptoms, such as a widening gap between social classes. Accordingly, I am keen to see economic development go hand in hand with the improvement of citizens’ living conditions. I do not want a two-speed system in which the rich reap the benefits of growth, thus becoming richer, while the poor are excluded from the development process, thus getting poorer and suffering more deprivation. The National Initiative for Human Development is part of this vision and many countries have expressed the wish to take advantage of the experience that has been gained. The social components of sectoral schemes are also part of the same vision and are particularly focused on local and human development. 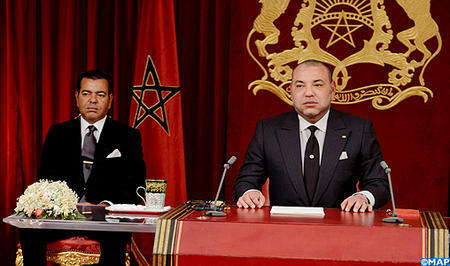 The aim has been to confirm the reputation of Moroccans, who are known for their seriousness and devotion to work. They have indeed confirmed their ability to produce and create, when the necessary tools are available and conditions are favorable. They can perform any task, whatever it is, big or small, intellectual or manual, despite the bane of unemployment. The human element remains Morocco’s genuine wealth and a basic component of the intangible capital which, in my State of the Nation address, I asked to be measured and assessed, given the role it plays in the development of all projects and reforms and in the access to the knowledge economy. The progress made by Morocco is not accidental. It is the result of a clear vision and a precise strategy, as well as the fruit of efforts and sacrifices made by all Moroccans. In this context, I would like to pay tribute to the successive governments for the genuine patriotism and high sense of responsibility they showed during the time they were in charge of public affairs. I would also like to pay homage to national businesses for their role in promoting the country’s social and economic development. I also hail the growing role of civil society organizations and the active part they play in the development process. I would particularly like to commend the action of political parties and serious trade unions, described in the Constitution as essential political players, given their militant record and the true patriotism and sense of responsibility they display when it comes to dealing with the nation’s major issues. I would also like to thank trade unions for the major role they have played during the last 15 years in achieving comprehensive social peace, without giving up their immutable principles when championing economic and social interests and upholding the rights of the working class. I have responded favorably to their request regarding representation in the Upper House, which, in the early draft of the fundamental law, was only open to representatives of local communities. I am keen to see these organizations continue to play their social and development role, while remaining committed to fulfilling their national duty in terms of construction, reform and social peace, just as they take advantage of the legal rights they have been granted. Finally, I would like to pay tribute to the members of the teaching profession, men and women, particularly in rural areas, for their efforts in educating generations of qualified executives, who have done their share in promoting development projects, as well as for the sacrifices they make for the education of future generations. Catching up with emerging nations is not an impossible challenge, despite the difficulties and obstacles it involves. Morocco – thanks be to God – has the potential to rise to the challenge, namely its responsible and clear-sighted youth. Thanks to their patriotism and creative genius, I am confident that our young people can achieve their country’s development and ensure its access to the club of emerging nations. This is the way to continue bearing the torch of a renewed Revolution of the King and the People, in perfect symbiosis between all components of the nation, and remain faithful to the hero of this revolution, His Majesty King Mohammed V, and his companion in the struggle, my revered father His Majesty King Hassan II – may they rest in peace -, as well as to the valiant martyrs of the liberation and independence.